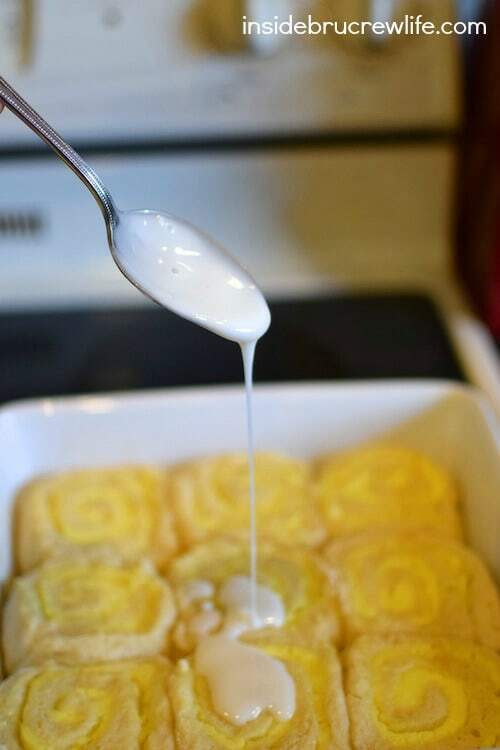 These Lemon Cheesecake Rolls are a delicious sweet roll to share for breakfast or brunch. They are easy to make and can be on the table in under 45 minutes. *I am partnering with Lucky Leaf to bring you a delicious pie filling recipe. Spring has finally sprung in our area. The weather has been cool, warm, rainy, and then sunny. And that was all just in one week’s time. We have been so excited to be outside enjoying the fresh air after being inside for so many months while it was cold. Our kids have been on the trampoline every single day bouncing like crazies, and I see many more days of us enjoying our deck and trampoline in the next few months. When I received a box of pie fillings, I was so excited to get baking. The first pie filling that I wanted to use was the lemon. When spring hits, my taste buds automatically want all things citrus. One of my favorite things to make for my family are easy, no yeast cinnamon rolls, so I decided to tweak these Oreo Truffle Cinnamon Rolls using pie filling and cream cheese. 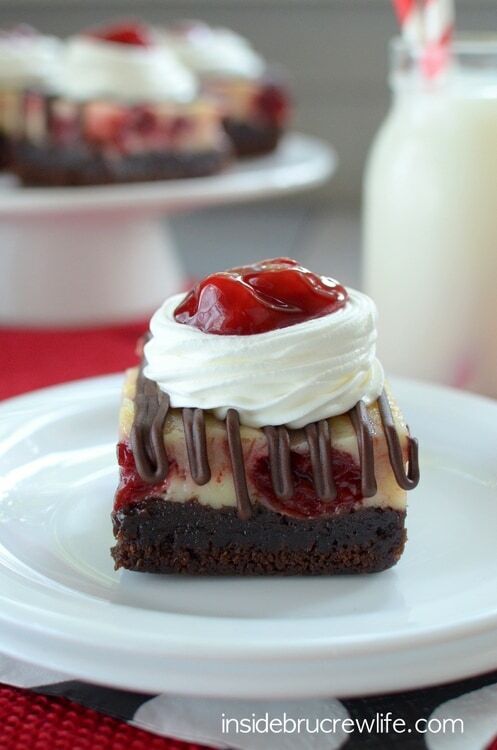 Yes, I am all about adding cheesecake to all the things….even breakfast! I started by mixing up the sweet dough with lemon zest added to it. My hands and kitchen smelled so lemony fresh as I was working on these. Before spreading the dough out, I stirred together a can of lemon pie filling and some softened cream cheese. No extra sugar is needed in this filling because the pie filling added just enough sweet and tart to it. Use your hands to spread the dough out into a 10×14 rectangle. I usually keep a measuring tape in one of my drawers for things like this. Make sure to keep a thin layer of flour between the dough and the counter and on your fingers as you press it out. Then spread the lemon filling over the dough leaving about an inch around the border. 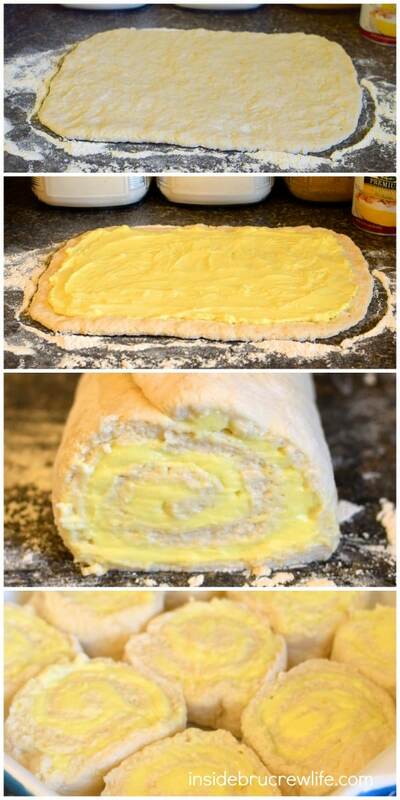 Gently roll the dough up and cut it into 9 even slices. Place the rolls into a buttered dish and bake for 22-24 minutes, then remove and drizzle the lemon glaze on top while everything is warm. It will melt and soak into every part of the rolls. I seriously couldn’t wait to dive into one of these rolls. The sweet dough filled with lemon cheesecake and topped with lemon glaze was absolutely delicious. 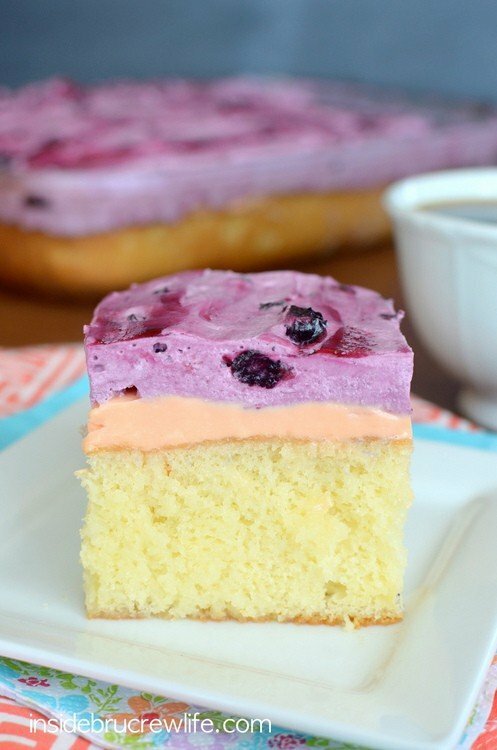 These would be the perfect breakfast or brunch treat. And I just love how bright and cheery these rolls came out because they remind me of spring and all those bright flowers that will be popping up soon in my flower beds. These easy, no yeast rolls are filled with a lemon cheesecake filling. 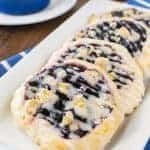 They are the perfect breakfast or brunch treat. Mix together the flour, sugar, baking powder, baking soda, and lemon zest. Create a hole in the mixture. 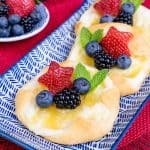 Pour the lemon juice, buttermilk, and 2 Tablespoons melted butter into the hole and mix gently until soft dough forms. Turn the dough onto a floured surface and knead a few times before pressing the dough into a 10x14 rectangle. Be sure to keep a light layer of flour between the dough and the counter as you are pressing. Stir together the lemon pie filling and cream cheese and spread over the dough. Make sure to leave 1 inch around the edges. Roll up slowly from the shortest side. Cut loaf into 9 even rolls gently. Grease a 9 inch round or 10 inch square baking dish with 1 Tablespoon of butter. Place the rolls into the pan side by side. Drizzle the remaining melted butter over the rolls. Bake at 400 degrees for 22-24 minutes. Remove from the oven. Whisk together the glaze ingredients and spread over the warm rolls. Serve immediately. Store the remaining rolls in a covered container in the refrigerator. Reheat for 10-15 seconds in the microwave, if desired. Wow. This is an INCREDIBLE idea. 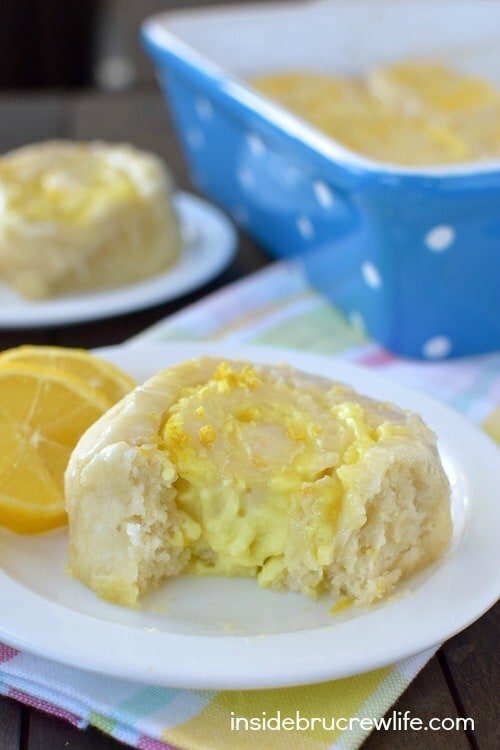 I love using lemon pie filling in rolls! And it’s a great way to celebrate trampoline weather! These lemon cheesecake rolls are making me drool. I love the idea of using pie filling as the roll’s center. What a great idea! It’s still freezing where I live, but the forecast is calling for 40s and 50s later in the week. I’m ready for all things outdoors…and lemon! Our weather keeps going back and forth…I’m ready for it to stay warm!! That’s so exciting that you’re working with Lucky Leaf, Jocelyn! These rolls look absolutely amazing. I’m drooling over the lemon flavor. So perfect for spring! Pinned! Cheesecake INSIDE A ROLL? FOR REAL? This is all my favorite things rolled up (literally) into one amazing recipe! That lemon is perfecto for Spring eating too 🙂 Pinned! Yes, it’s the perfect way to welcome spring back 🙂 Thank you for the pin love!! 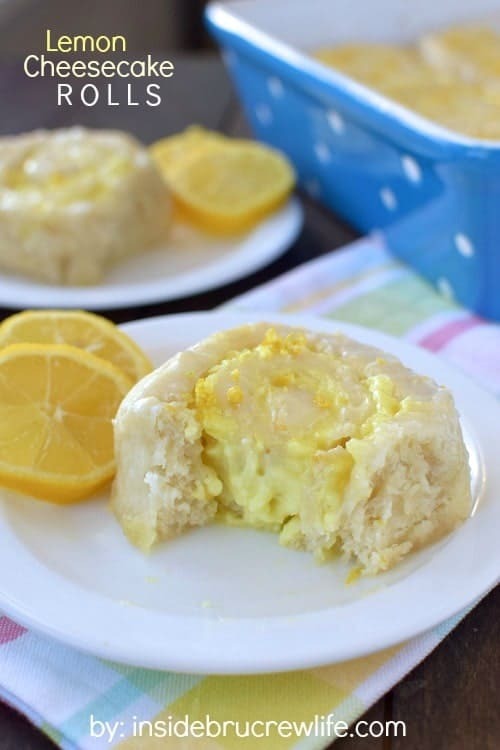 You have tempted me this morning with these gorgeous Lemon Cheesecake Rolls! I am thinking Easter breakfast!!! Oh, these would be great for an Easter morning breakfast. I hope you enjoy them! Yum diddly! 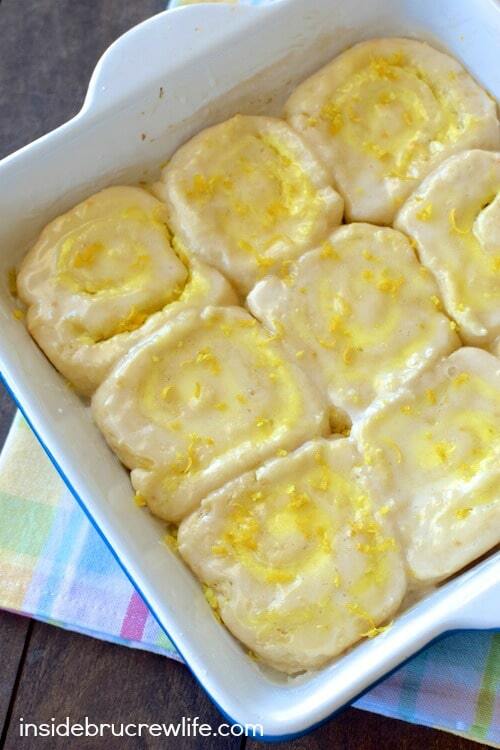 Lemon rolls look so scrumptious! There is something about lemon and pastries that I am totally loving right now!! Sure wish we could do breakfast and coffee chats!!! 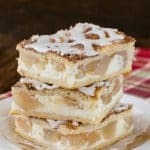 Cheesecake and sweet rolls together? HEAVEN! I am so excited for spring to be here!! Yes, that glaze was the perfect touch on these rolls!!! Congrats on your partnership with Lucky leaf! Love the lemon cheesecake flavors in these rolls. It’s a wonderful breakfast to welcome in spring. Thank you 🙂 Cheesecake is perfect for welcoming just about anything, right? This is right up my alley! I am a total lemon fanatic! Oh my gosh, I am absolutely drooling! I’m usually in charge of quiche for Mother’s Day brunch, but I feel like I’ll need to add a pan of these rolls to the buffet this year, too! These look fantastic! Can’t wait to try them! They will be a great addition when I host a brunch! I can’t get enough lemon these days! These rolls look so soft and delicious! I have been feeling the same way about lemon lately! These rolls were so soft and yummy!!! 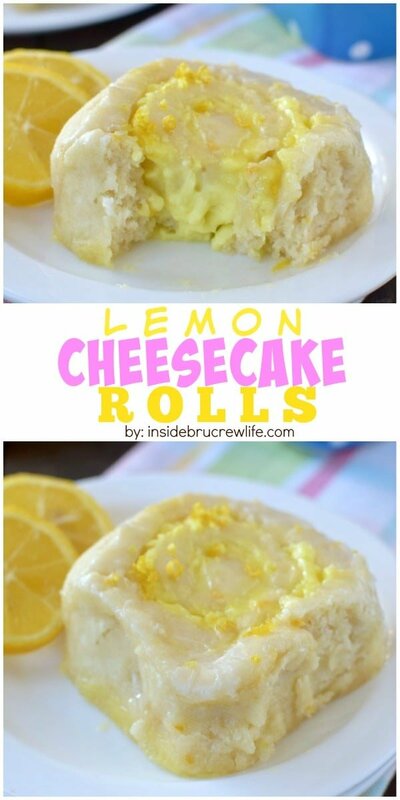 Lemon CHEESECAKE rolls?! YES PLEASE! I am loving every lemony second of these rolls, Jocelyn! These look heavenly! I love the idea that Lucky Leaf doesn’t have any high fructose corn syrup. I will have to look for them next time I’m at the store. Yay for warm weather and all things lemon!! Hehe. My kids have been on the trampoline too. They love that darn thing. Not me, I get sick. Yuck. I could make these while they jump, then make a big ole’ cup of coffee and have a roll or two. 🙂 Pinned! Haha! 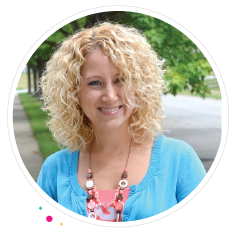 My kids laugh at my bouncing…apparently I don’t bounce very well. I’ll stick to watching from the deck with my treats!!! Um YUM! I’m starving for breakfast right now and these would be perfect! Hello! 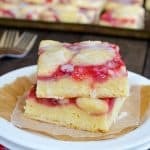 I just discovered your blog today and have enjoyed reading your recipes so much! 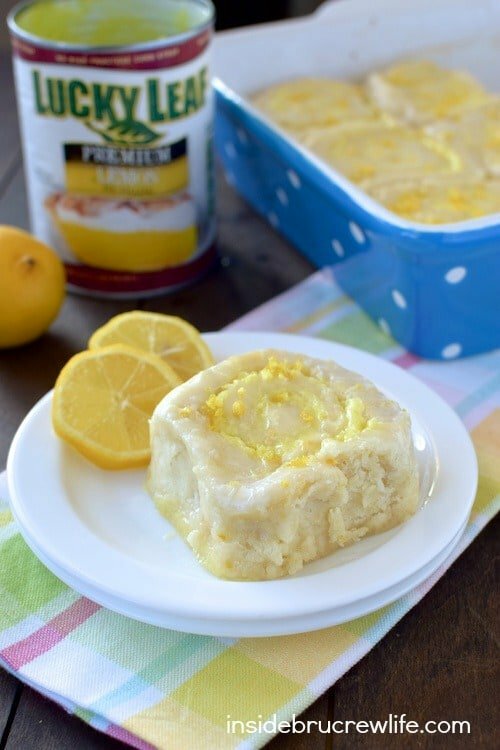 These lemon cheesecake rolls definitely caught my eye — our family loves lemon! 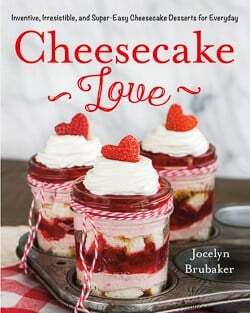 I am so excited that you found my blog and are enjoying the fun recipes I make! I am already a lemon addict, and then you add in cheesecake! Of course I need to make this. It sounds absolutely perfect! 🙂 Pinning, Stumbling and Yumming! Oh my goodness! 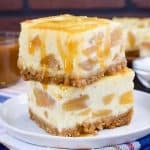 I am making these ASAP! I actually thought about adding blueberries to these too. I think it would be awesome in there!!! Yes, you can you use a homemade lemon pie filling if you like. 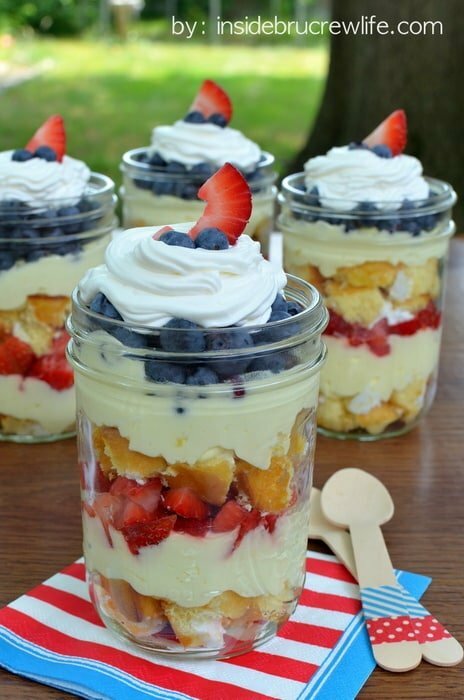 A homemade lemon pie filling would work in these as well. 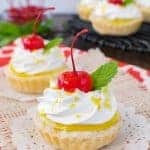 This recipe looks delicious & my Mother loves lemon, so I thought I would make these for her birthday celebration breakfast, I have 2 questions, could you prepare the dough the night before & refrigerate, then bake in the morning? And, have you ever doubled the recipe? Would it change the bake time? I have a lot of hungry people to feed! I have never made this dough and let it sit overnight, so I’m really not sure how it would do. It really only takes a few minutes to prepare it though. As for doubling it, it should be fine. I would just use 2 – 8×8 pans or 1 – 9×13 pan to bake the rolls in. Baking time should still be about the same. Maybe just a minute or two more if you use the 9×13 pan because they could be a little more crowded. These sound and look absolutely delicious !! I can’t wait to make them, like tomorrow!